It takes a special breed to enter the Indy 500, but to attempt to do so without the use of your arms or legs is simply out of the question. Until now, that is. 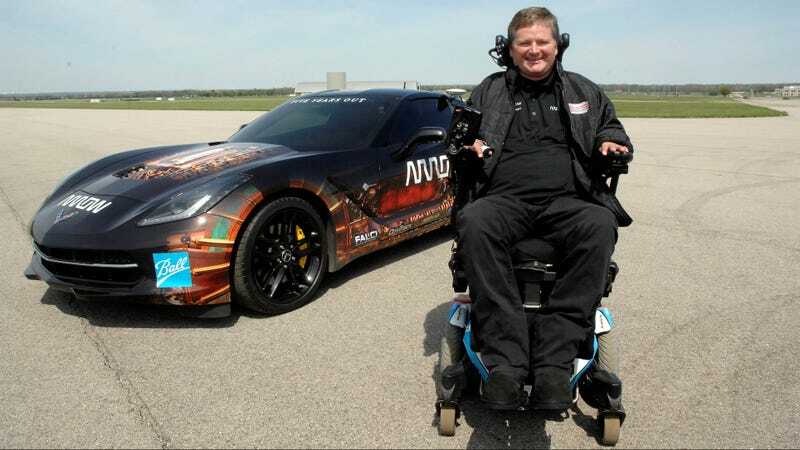 With the aid of his semi-autonomous race car, former Indy Racing League driver Sam Schmidt is in it to win it—or at least the four promotional laps he'll be racing before the actual event. Schmidt, who became a quadriplegic after crashing at Florida's Walt Disney World Speedway in January 2000, is now racing as part of the Arrow SAM (semi-autonomous motorcar) Project. This collaboration brings together Arrow Electronics, Ball Aerospace, Schmidt Peterson Motorsports, the Air Force Research Laboratory, and the nonprofit Falci Adaptive Motorsports in an attempt to return the ability to drive to physically disabled motorists. The car, a 2014 Corvette C7 Stingray, has been retrofitted with a number of new systems ahead of the race, most notably the ingenious steering and speed controls. The system actually works much the same way as the Eurofighter Typhoon's helmet HUD does: an array of helmet-mounted reflective infrared markers allow a series of overhead cameras to track and measure the movements of the driver's head. Tilting his head left or right, Schmidt steers the car in the same direction; tilting his head back accelerates while biting down on a mouth tube applies the brakes. These commands are fed through an on-board computer which activates servos that physically turn the wheel and work the pedals. The SAM has already been certified safe for the race. Its GPS warning system will alert Schmidt if he strays within a meter of the edge of the track and forcibly correct his steering if the car continues to drift. What's more, a safety officer will be riding shotgun and will be able to take control using driving instructor controls if necessary. And if they are both somehow rendered incapacitated, the car can also be controlled remotely from the pit.